December is the perfect time to take a step back and appreciate everything that you’ve achieved in 2012. So, we asked our Pinhole Pro ambassadors about their most memorable moments of the year. In addition to precious moments with friends and clients, they told us about falling apples, midnight swimming and groomsmen in their skivvies. 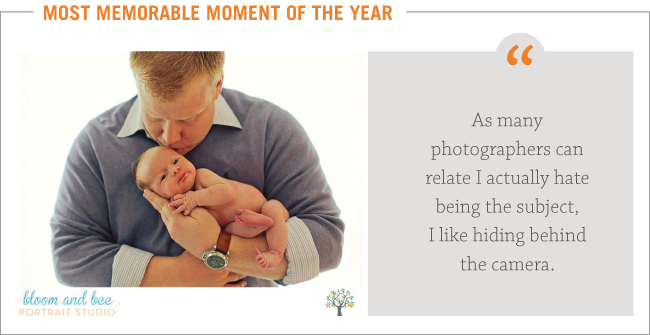 Tell us about your best moment from 2012 and we’ll continue to share your stories in this post and on Facebook. 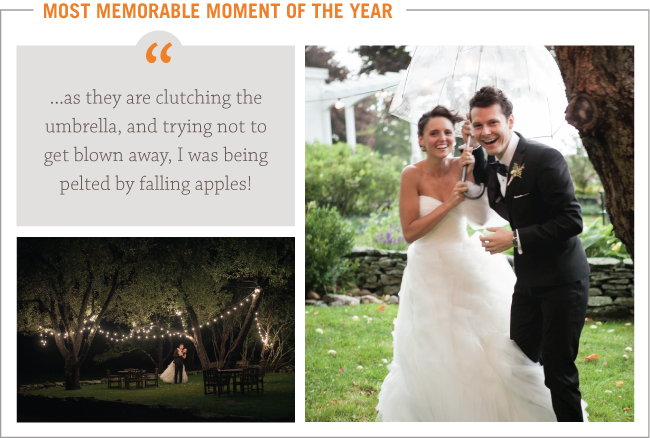 My most memorable moment of 2012 would definitely be shooting in a Vermont storm while getting pelted by apples! We all wanted outdoor group photos but we could see the storm coming. We started running, just as the wind started howling through the trees, and I kept shooting. The bride and groom really wanted these outdoor photos and thought it might be their last chance of the night. As they are clutching the umbrella, trying not to get blown away, I was being pelted by falling apples! We finally ran inside right as the rain came down. Looking at my photos, all I could do is laugh. I don’t think there was a non-blurry one in the group. I guess I really didn’t prepare for tornado-like wind and falling apples! Luckily, the rain stopped later in the evening and we were able to go outside and take some really beautiful portraits under the lights, with the fallen apples surrounding them. In the end, everything turned out just fine. Emilie Sommer – emilie, inc.
My favorite moments from 2012 were part of a wedding giveaway we collaborated on with a local magazine. We were asked to photograph the planning process of a deserving couple who won a wedding – starting with the press conference announcement to the big day and every step in between. I have never photographed a couple shopping for wedding invitations or sampling cake flavors or trying on wedding gowns. It was such fun! Each week the couples’ top three choices for each category were posted online by the magazine for a public vote and on the wedding day, all of the winning pieces came together for a spectacular celebration. The best part of this process, however, was the friendship I formed with this pair. I count them among my dearest friends and feel so lucky to have gifted them the memories of this exciting time in their lives. A Pinhole panoramic book detailing the planning days and I Do’s is definitely on our To-Do list once the images hit newsstands. My favorite memory from one of my shoots this year actually happened after the shoot. The wedding took place at a beautiful camp in the lakes region in New Hampshire. After two days of shooting, feeling fully exhausted and ready to sleep, I couldn’t resist taking a few minutes to enjoy the scenery. I sipped a beer while listening to the loons and the sound of the lake lapping on the shore and snapped a few frames to remember the moment. Then, I jumped in for a midnight swim! One of the most memorable moments of my career was photographing a birth this year. It happened to be a close friend of mine. I was scared since it is such a personal moment in someone’s life (so are weddings but ya know, a birth is just a little more “personal”). However, it ended up being the most amazing and memorable thing I have EVER photographed. These are the moments I won’t ever forget and pictures they will treasure for a lifetime. 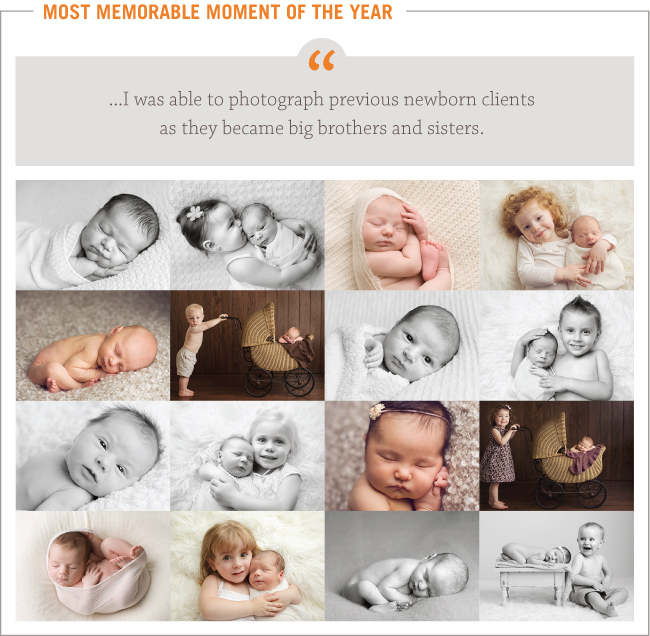 My absolute favorite memories from this past year of sessions are all of the times I was able to photograph previous newborn clients as they became big brothers and sisters. There is nothing quite like watching a family grow and welcome a new little person into their lives, or watching the baby of a family all of a sudden become the big kid. I love it! One of our favorite sessions this year was in Seattle, Washington. We had the opportunity to photograph Ali + Brock’s wedding in August. Since we live in Ohio, the only time for an engagement session was 3 days before the wedding. We met up with Ali, Brock and Ali’s parents in a small town called Port Townsend, just across the Puget Sound from Seattle. We challenge all of our couples to take us on an adventure or a date for their engagement session. Ali + Brock took us kayaking. Any view in Washington is breathtaking, and the view while kayaking is even better. As many photographers can relate I actually hate being the subject, I like hiding behind the camera (you all are shaking your heads in agreement). So often as a photographer and business owner, it can be easy to forget just how important it is that we capture people+families in time. For me personally this image is incredible, one that I feel proud of when I look at. I’m proud to be a father. I have this image on the cover of my Facebook, as my iPhone wallpaper, and I show it to everyone who asks (and truthfully to a lot of people who don’t).